As all of us UQ Holder fans are painfully aware of, Crunchyroll still cannot be bothered to upload UQ Holder chapter 154. As such, after numerous hints over the years from blog reader mattcgw‏, I decided to give it a try. By May 2016, comiXology Amazon backing allowed them to launch their monthly subscription service called comiXology Unlimited. Many comic book and manga publishing houses, including Kodansha Comics and Dark Horse, joined. Marvel and DC passed, opting for their own services. However, when I examined comiXology Unlimited for myself, I saw a large number of Marvel titles out there for borrowing purposes, including the entire original Secret Wars series from 1984. No DC titles were available to be borrowed. To view borrowed or purchased items, one either needs to have the comiXology app installed on their mobile device, or they can go to comiXology’s website and use the browser viewer. When it comes to the subscription service, it does not appear that comiXology Unlimited allows people to “borrow” a manga chapter until it has been out a while. So as a replacement for Crunchyroll, it will not suffice at all. However, in the case of UQ Holder, if you don’t mind being two months behind everyone else, you can “borrow” that chapter. Be warned that like CR, comiXology Unlimited only carries the latest chapters not in print for borrowing purposes as well as the first chapter. If you are willing to pay $0.99 a chapter, plus tax, you can purchase the latest chapter immediately when it becomes available without waiting until 5pm PST of the 8th of the month. In theory, once you pay for it, it is yours for as long as you have a device that can read it. The chapters are DRM infested, which is so freaking stupid beyond belief. But fools need to “feel” that they are stopping piracy with this DRM crap, even though they aren’t. One can have (DRM) copies of whatever comics/manga in comiXology Unlimited downloaded to their mobile device (or PC) for offline reading. The only single chapter item I purchased was UQ Holder chapter 154. I also decided to purchase volumes 17-22 of School Rumble to finally be able to finish reading the bloody series. (I’m still hopeful Kodansha Comics releases it in print, but not that hopeful that they will.) 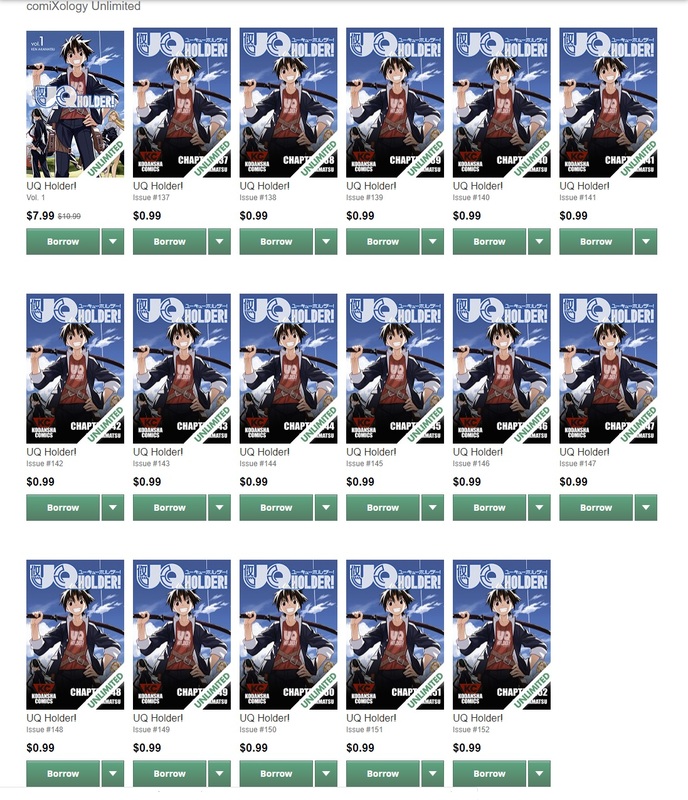 As with the unlimited, these DRM-infested copies of the purchased manga can be downloaded to your device (or devices) for offline reading. If manga weren’t DRM-infested, one could get PDF files and simply read them in Adobe (or whatever). Since that’s not the case, I’ll go over the two readers–one for the website and the app reader. For the web reader, the controls are hidden unless you move your cursor to the bottom of the page. The controls are easily understood. 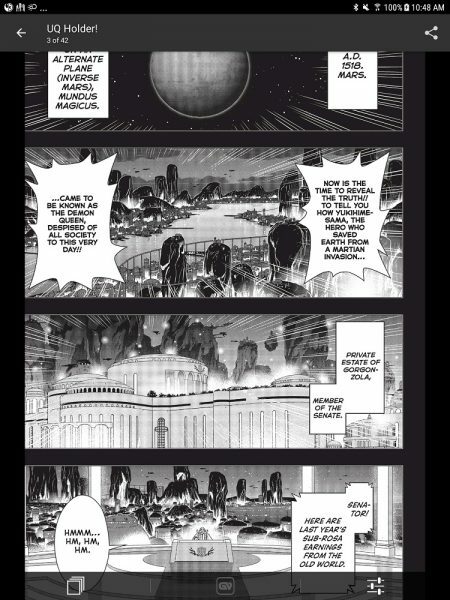 The “Guided View” mode is disabled for manga. I presume this is because of the reverse reading method for manga. For comic books, guided view zooms into the page to whatever text is suppose to be read next. And with the “2 Pages” view, one can easily see the 2-page art spreads quite nicely. In the app version, you are out of luck when it comes to viewing 2-page art spreads. Even if you try horizontal view, you are only seeing the single page, and then zoomed in to fit the width of the screen. Otherwise, the app version is serviceable for allowing one to read the manga or comic book of your choosing. Below, you can see controls when activated on the app. For me, physical books will ALWAYS trump digital books. However, I can understand the appeal of books in digital form. Indeed, it would allow me to take a manga library with me on my business trips or even on vacation, which is a good thing. So I have nothing against digital manga/books/comics. I do find myself loath to double-dip spend just to have a digital copy of a manga title that is DRM-infested. 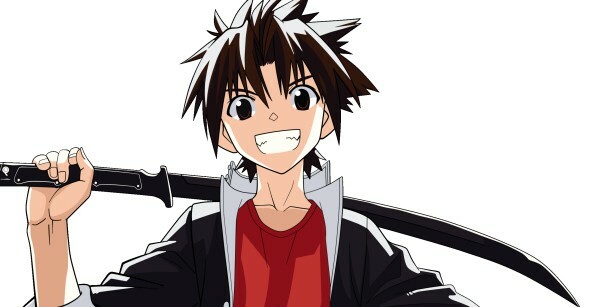 As to the Crunchyroll situation with their failure to upload UQ Holder 154 (which is still down as I write these words), comiXology does offer a legal method of getting the UQ Holder manga chapters. Amazon kindle/comiXology will save and grow the American comic industry. Especially with sales, normalising more manga price ranges. £13 for the first volume of a dc book that may almost certainly be cancelled cancelled because they can the new 52 in favour of Rebirth!?! Hell no. £2.75 for that book and every other one in its series, hell yes. That’s how I’ve been reading ms marvel, on the cheap. Kindle app, is a much better reading format. Especially on a tablet. I tried the unlimited service. As such, I finally got to read the X-Men vs Avengers series. I knew about it from having played Marvel Avengers Alliance and having the Phoenix Five characters (sans Namor, but substituting Jean Gray’s Phoenix in his stead). I was amazed at how the story really failed to grip me. It was the same for other comics, even ones I own in storage, like the original Secret Wars. Maybe I’m just too old. ? And yet I mostly love the MCU movies. Go figure. The only time I use my tablet is on my short jaunts for business. I recently got back from a trip and I still haven’t even bothered to plug my tablet back to my PC. ? I don’t like this. However i have sneaky feeling that the writing is on the wall for CrunchyRoll is at hand. People who are running the show at CR are either frustrated, utterly giving up supporting it, or worse not trying react something going bad on their end. Perhaps, this that moment where once something broke, their not going to be bother to try fix it or worse, there no one left who can since they maybe thinning their staff. I do not want have buy a temporary comic. I will always buy physical, but i have felt the way CR was doing it was temporary because of how in flux copyright is. it’s major bummer. I don’t think this new way getting manga be boom, it maybe fatal blow. I don’t like this. However i have sneaky feeling that the writing is on the wall for CrunchyRoll is at hand. If I had to guess, more people come for the anime than the manga. But with Netflix becoming more serious about anime, and FUNimation pulling out of their partnership with CR, you may well be right. I’m with you here. While I certainly see a value in owning a digital copy of a manga, I’m with you in that I want a physical copy. I pre order every English volume, but you have to buy digital if you want to keep up with the series. vol 15 was just recently released in English while Japan is coming up on vol 19. The only problem I have with Comixology is that I can’t go to the next page using my scroll wheel. you have to buy digital if you want to keep up with the series. Actually, I buy the physical books. I much prefer reading manga in book form. Haha! Which is why having DRM in the first place is so stupid. It doesn’t prevent piracy. Heck, when Crunchyroll couldn’t be bothered to upload UQ Holder chapter 154 for 2 weeks (or so), someone bought the chapter from comiXology and then uploaded it to aggregate sites. Personally, I’d prefer things to be in a PDF form rather than behind a stupid DRM thing. Hahaha! Wow. That’s before it is out in Japan. ?